The Director, Mumbai International Film Festival, Shri Manish Desai, at a Press Conference, during the 48th International Film Festival of India (IFFI-2017), in Panaji, Goa on November 26, 2017. Open Forum session with the theme – ‘Crowding the Social Media: Is Documentary the only source of Genuine Information’ was attended by Manish Desai, DG, Films Division, Siraj Syed, Senior Journalist, Dheep Joy Mampilly, Deputy Director (Social Media Cell) PIB; social media experts and aspiring documentary filmmakers. The session was moderated by Shashwat Gupta Ray, (Resident Editor – Gomantak Times).Shashwat Gupta Ray said, “There is hardly anybody left today who is untouched by the social media. Most of us are connected through the social medium. Interestingly, the divorce cases have increased because of the over consumption of social media by married men and women as there’s hardly interaction left between the married couples.”“Films and documentaries are also not untouched anymore. It’s a vital element that we are discussing today. My view is more of an issue of content and the medium through it is liberated than the medium itself. The concern is whether the content that is being generated is for which platform. And accordingly, we need to work on that front.”The digital age has been changing dramatically. The digital revolution has totally redefined the documentary filmmaking. Anybody who has a smartphone can be a documentary filmmaker because over a period of time and the advent of social media, the trend of micro documentary genre has come to fore across the world. 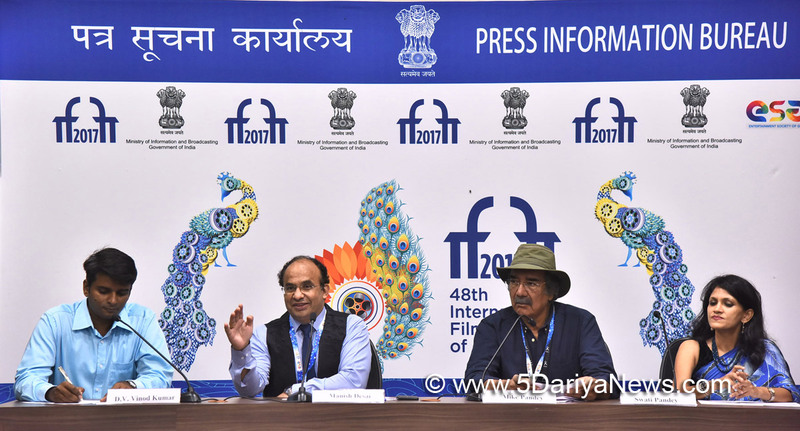 The structured documentaries have their own rules and regulations and they want to bring a change in the society in a particular way,” added Manish Desai.The 48th edition of IFFI is being held from the 20th to 28th of November, 2017, in the beach state of Goa.